No cookie says Christmas more than gingerbread. Here is our favorite recipe that tastes great and makes a wonderful background for icing. 1. In a large bowl, sift together the flour, baking soda, and spices. Set aside. 2. In an electric mixer fitted with the paddle attachment, cream the butter. 3. Add sugar and beat until fluffy. 4. Mix in eggs, maple syrup & molasses. 6. Divide dough in thirds; Roll each third between 2 pieces of parchment paper. You will have 3 separate pieces of rolled out dough, each one sandwiched between 2 pieces of parchment paper. 7. Put rolled dough, including the parchment paper, on a cookie sheet and chill for at about an 45 minutes. overnight. 9. Working one sheet of dough at a time, remove top parchment sheet and cut out shapes using cookie cutters. Leave shapes on parchment paper and remove scraps to re-roll. 10. Bake until crisp but not darkened, 15 minutes. Remove from oven. Let sit a few minutes and then use a metal spatula to transfer cookies to a wire rack to cool completely. Decorate as desired. This entry was posted in Christmas Baking Ideas, Cookie Recipes & Ideas, Recipes & Tips and tagged gingerbread cookie recipe by Fancy Flours. Bookmark the permalink. How thick should I roll out the gingerbread cookie dough to have it bake in 15 minutes? Thank you. Our cookie expert says that she usually does her dough at 1/8″. Can you freeze “no fail sugar cookie”? 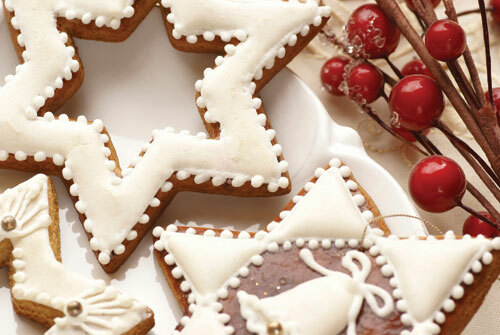 Can you freeze “no fail sugar cookie” with the royal icing and “wafer paper” affixed to it? And how long can you freeze it? Thanks! Hi Michelle – Yes you can freeze the No Fail Sugar Cookies. You can also freeze them with royal icing, however you can not freeze them with the wafer paper affixed to the royal icing because the moisture will ruin the wafer paper. I would recommend that you bake, ice and freeze your cookies in advance and then adhere the wafer paper right before you need them if you are wanting to save on time.